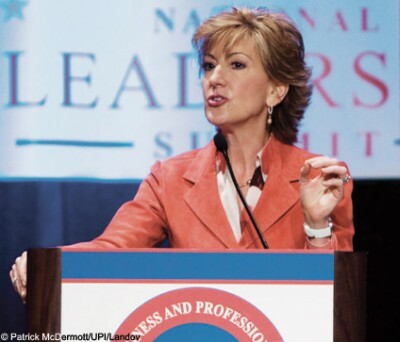 As CEO of Hewlett-Packard from 1999 to 2005, Carly Fiorina was the first woman to lead a company on the Dow Jones Industrial Average. Though her strategy to acquire Compaq Computer--which split the board--was ultimately proven correct, she was ousted over its execution. Some thought obscurity would be her next stop. But Fiorina went on to write a best-selling memoir and is today one of John McCain's most ubiquitous campaign surrogates. She discusses the business of politics and the politics of business with contributor Judith H. Dobrzynski. You've made a big leap, full-time, into politics. What's the attraction? I didn't expect to be doing quite as much politics as I am right now. But I'm involved because I think John McCain is a genuine leader who has both pragmatism and core convictions. What's the overlap, or biggest difference, between business and politics? Politics is a business, if you will, with one product, that being the candidate, and the goal being for the candidate to win. It's much different than having a diversified business with lots of products, customers, and different markets. But one of the important things I've learned is, whether you're working in government or in business, people tend to act pretty much the same in certain situations. So there's a lot of commonality in what it takes to get an organization to function effectively. In business, you need to understand, if your competitor makes a big move, what the implication is. But you don't spend every hour checking on what Dell did in the last 60 minutes. In politics, you do need to understand what's happening on the other side hourly. I personally don't have to be on top of every single thing that is going on in the campaign every minute. But today, because I am engaged in the rollout of this economic week, I am paying very close attention to how it's being responded to on the other side. I know it's sick, but I have two BlackBerries going all the time. I have at this moment a television on the desk next to me; I've been doing a great deal of media today, so I am in this constant mode of checking on how it's going, how it's playing, what the other side is doing, and trying to keep focused on the message that we need to be delivering at the same time. Sort of super multitasking. Are you bringing your business expertise to the management of the McCain campaign? No, I don't run or manage the campaign. If people ask me for specific advice, I'm happy to give it. My role is to advise the candidate on certain issues and to advocate on his behalf, but I'm not into the cash-flow management of the campaign at all. How has it been adjusting from the CEO slot to being one member of a high-powered team with others making the decisions, not just you? The reality is there are very few decisions that only one person makes. Do they have the power to? Sure. But most good decisions get made by people coming to a common understanding of what's the best way to achieve the objective. So it feels a lot like the rest of my career. You went through a media storm when you left Hewlett-Packard. Do you think Zoe Cruz and Erin Callan got a fair shake when they were ousted from their prominent Wall Street spots? Women in positions of power are still talked about differently, treated differently in the media, scrutinized differently, and characterized differently. Whether that is responsible for someone's downfall is another issue, but there is no question that it makes the role more difficult. I have great admiration and respect for Hillary Clinton, as a leader and as a candidate, and I also have great empathy for the experience that she had out on the campaign trail. There's just no question it was different for her than for her male colleagues, and there's no question it was different for me as a female CEO. Thankfully, everyone has realized that the expression of racism is unacceptable. But I don't think everyone has realized that the expression of sexism is unacceptable. And people don't comment on it. So when hecklers at Hillary Clinton's campaign rallies hold up signs that say "Iron My Shirt" and nobody comments, then we're not advancing people's understanding. When not enough people talk about the fact that there's so much attention paid to a woman's style, personality, clothes, and appearance and less attention paid to her substance, then the pattern continues. I think the media has a role in it, so I will turn it around: What do you think you can do about it? People should keep remarking about it. But then it tends to sounds like whining. I happen to be a business person, so I tend to believe that facts are important. And I think if you keep drawing attention to the facts around the commentary and the coverage, the story gets to be pretty clear about the difference in treatment, and the implication about the difference in respect. But weren't some of the same charges leveled at JFK in the 1960 campaign? Everyone talked about his looks and his photogenic family and their lifestyle. Do you think there is that skew for women, or is it just a highly visual culture that's often fixated on the superficial? I certainly think you're correct that we live in a very visual society and style is important, but I also think that a woman's style or appearance conveys to many people still more about her substance than it should. I could be wrong, but all the discussion about John F. Kennedy's style and good looks, no one confused that with lack of substance. It's more of an added benefit. He's president of the United States and he's stylish. As opposed to style, perhaps, disguising the substance when it comes to women and how they're covered. I mean, why were Hillary's pantsuits so [talked about]? Is it the plight of the pioneer to be so carefully scrutinized that the first of any genre, so to speak, will be under the microscope? Or is it just sexism? Pioneers are under a microscope in a different way, and when we're confronting something that's new--"the first of," to use your phrase--there is intense curiosity and maybe unrealistic expectations, both positive and negative. Now that women have achieved some power, is sexism more subtle than it was, say, 20 years ago? Of course, of course. Look, women have made remarkable progress, and one must be realistic about it and celebrate it. But you know, just look at the data: 16 percent of the senior officers and board members in corporate America today are women. That number hasn't changed in five years. And it's clearly not the case that we don't have enough qualified women, as would have been the case 20 years ago. And what about your own experience with bias? It's different as you have more title and responsibility. It's also true, however, that when I was a midlevel manager and when I was a CEO, people would say, "Well, she has great presentation skills, but maybe she doesn't have the substance." You know, that's the same. You went to Stanford and MIT, but it's probably less well known that you went to high school for a year in England, attending the Channing School for Select Young Ladies. Anything you took away from that experience, vis-a-vis the American education system? Well, I took away that in an all-girls school, girls can find a million ways to get into trouble. I met some distinctly unselect ladies. It was great fun, actually, like being in a movie. Speaking of England, why do you think the U.K. didn't have a problem embracing a female head of state, now almost 30 years ago, while the U.S. still seems uncomfortable with that notion? It's an interesting question. Maybe because England has had a queen. There's some familiarity with seeing women in a position of authority. If McCain wins, do you expect to be in the administration? I don't have any expectations; I am just doing the best job I can right now.